It’s a Big week this week! Posted on December 10, 2018 by admin | Comments Off on It’s a Big week this week! We’ve got a big All Day Game Day planned for this weekend, with lots of games, big and small. We’re featuring the newly pimped out Print ‘n’ Play version of 18EU, a train game in the 18XX series of train games. We’re also going to be Playing Merchant of Venus, a Pickup and Deliver game of galactic proportions! We’re having another go at Thomas’ X-Wing-Variant-space-combat-game-without-a-cool-name-yet. If there’s still time after that, we’ll try Brass, which puts players in the shoes of entrepreneurs in England during the industrial revolution. Check out the page for the event for more info! Comments Off on It’s a Big week this week! The road home. We had a nice relaxing breakfast in the rooftop garden restaurant again (can you believe the view? ), and then got picked up and transported to the airport. Oddly, on the flight from Athens to London, they didn’t even give out water without you paying for it, yet on the London-Boston leg, they gave up to 2 alcoholic drinks and 2 1/2 meals for free. Of course, trying to eat in coach class is always a challenge. That about wraps up our 2018 vacation. We had a fantastic time. After reflecting on the whole trip, here are some of our final impressions. Rome was a fascinating city that I’d be willing to visit again, though given a choice, I’d find a hotel closer to downtown, and I’d study the Metro system more. I felt there was plenty more to see there. On the other hand, I think I’ve seen everything I need to see in Athens. Beyond the historical sites, which you can cover in a couple of days, it’s just a big city. Athens had the cleanest Metro stations of any city I’ve ever been in. In both cities, in fact in every place we visited on this trip, I was delighted with the abundance of al fresco restaurants. In the 2 cities, they were literally stacked together to the point where sometimes it was hard to tell where one restaurant ended and another began (usually the giveaway was the tablecloths). I would like to have had a couple more days in Rome especially, so that I could have spent some more time relaxing in those restaurants. We definitely felt a bit rushed to see as much as we could. Boy, you can’t get away from the smokers over there. It seems like EVERYBODY smokes, and unlike in the U.S., they can pretty much smoke wherever they want. The daily schedule of hosted events on the ship didn’t SEEM to be as dense with activities as on previous voyages. The shows in the theater were of a much lower quality than on previous cruises we’ve taken. Jeannie was a little concerned about the state of the ship; there was water leaking from the ceiling in the cafeteria, and one bank of elevator buttons wasn’t working (the elevators themselves were working, but the call buttons were not). We had great experiences in both cities with the Hop on Hop off busses. However, they are not the most efficient way to get around. Use the Metro to move fast. 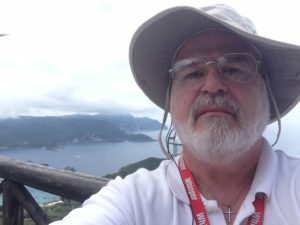 Avoid the “walking tour of the town” excursions. Very often, the guide alternates between boring you silly with a long monologue about something you barely care about, and rushing from place to place to make sure that they check the box for seeing everything the tour description promised. You can really do just as well on your own with a good guidebook or audio tour. I highly recommend Rick Steves’ walking audio tours. Full day excursions are exhausting. Avoid them if you can. Be sure to allow time to enjoy the ship’s amenities. Don’t book an excursion on the last cruise day. Especially not a full day excursion. It makes the whole offboarding process a bit too hectic. Take half as many pants as you think you need, but be sure to have a ‘day’ shirt and an ‘evening’ shirt for at least 2/3 of the days you’re onboard. That’s assuming that you will do laundry at least once if not twice while onboard. The ‘evening’ shirt (for men) should have a collar if you’re eating in the main dining rooms. Your ‘day’ shirt will be pretty stinky by the end of the day if you’ve done any excursions. Speaking of which, plan to do laundry on the ship either really early or really late, since those ship laundromats stay pretty busy. Also, when choosing your wardrobe for the trip, try to pick colors that can all be washed together, because the laundry costs about $9 / load. Don’t bother with the specialty restaurants. The food and the service in the specialty restaurants are slightly better than in the main dining rooms, but IMHO, they’re not $30 better. I will point out that the little annoyances that I’ve documented here in this blog series were just that: little annoyances. They did not detract from the overall greatness of the trip. Because this was a GREAT trip. We had a blast. 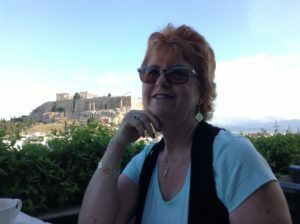 Today, Jeannie and I started out together, just taking a leisurely stroll around the base of the Acropolis, comparing notes about the tours we had taken the day before. Not surprisingly, there was a lot of overlap. Once we were done there, I wanted to visit one more Archaeological site, so we agreed to meet for lunch. I visited the Ancient Agora, which was the city’s main marketplace in ancient times. After lunch, we were strolling around the touristy district when it began to rain. Downpour, really. Cats and dogs. That lasted about 2 hours, and after a bit more wandering, we ended up in the square where we were to meet our guide for the evening. 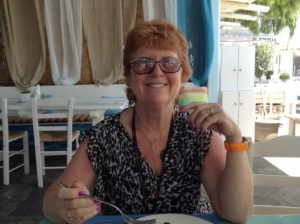 This last excursion of the vacation was one that Jeannie planned for me: a Greek cooking class where we would prepare, under the tutaledge of a professional chef, an authentic 5 course Greek meal, and then enjoy the meal we had prepared with chef on the rooftop dining room. We really lucked out, because there was only one other couple in the class, so it was like getting a private lesson. The class itself was great fun and informative, we learned quite a bit. 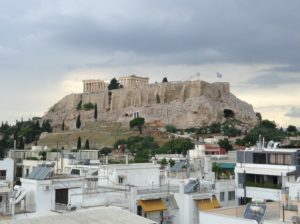 Then, we enjoyed the meal on the roof with a great view of the Acropolis, and great conversation with our chef and the other couple. What a great last adventure for our vacation! This morning, Jeannie and I took separate paths again. I was planning to get a “Combo Pass” to several of the city’s monuments. The Rick Steves guide I got from Kathy H. indicated that I should go to one of the lesser monuments to get the pass, since then I could skip the long ticket line at the Acropolis. So after breakfast I went across the street from our hotel to the Temple of Zeus, which was supposed to open at 8am. However, there was a sign saying that it wouldn’t open until 9:30. So I resigned myself to the fact that I’d have to wait in line at the Acropolis, and headed that way. However, when I got there, not only was there a long line there, but it was also not open yet. There was a caravan of black vans and limousines, though. Apparently there was some VIP in town (rumor had it that it was the President of India, and the garb worn by his entourage supported that) who was given the run of the place first thing in the morning. Anyway, we waited about a half hour, and finally the entourage left, and we were able to buy our tickets. I suspect that their next stop was the Temple of Zeus that I had tried to get into earlier. Funny side note: there was a lot of security around, including a pair of snipers who hustled down to their vehicle just before the main body left. Only they weren’t in a sleek black van, but in a beat-up old Pathfinder, which they had a real hard time starting! I wondered if we would have to keep them push it to a decline, but they eventually got it going, and followed the rest of them down the hill. 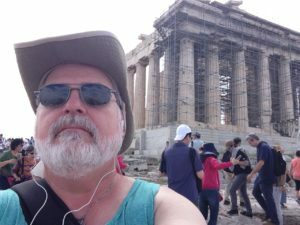 Anyway, there I was, finally, at the Acropolis, where I could compare the original Parthenon with the full scale replica that we had seen in Nashville TN last November. I was being guided by a Rick Steves audio tour that I had downloaded, and boy was I impressed! He gave just enough info to be interesting without being boring. The timing was excellent too. He and his co host talked just enough for you to comfortably stroll through the particular area of interest, taking the pictures you wanted, without too much hurry. So, what can I say about the Acropolis itself? It was awe inspiring. It was breathtaking. It was just cool. When I was done there, I continued on with a walking tour of the ancient city. Sadly, my iPod battery gave out halfway through the tour, but I was able to complete it with the aid of the printed guide. Meanwhile, Jeannie was off adventuring on her own. She did some shopping in the morning, and took a (human) guided tour of the ancient city in the afternoon. That tour was included with the purchase of our Hop on Hop off tickets. In the evening, the whole group of us (9 in all) had dinner on top of the tallest hill in Athens. The view was spectacular, the food was delicious, and the company was great. When we got back at about 11pm, Jeannie and I were still ready to go, so we thought we’d have a nightcap at the restaurant on the roof garden of our hotel. We met a young couple (Mason & Sasha) of the same inclination, and so we joined them for a drink and pleasant conversation; a very pleasant end to the day. We were kicked off the ship at 9AM this morning. Since we didn’t have any arranged transport to the hotel, we got into a taxi, which we were told would cost about 23 Euro. We made the mistake of not confirming that before getting into the cab. Sure enough, the cabbie started chatting us up about him taking us on a private tour of the city for “only” an extra 120 euro. Once we had firmly declined, he went suddenly quiet. He ended up charging us 40 Euro for the trip, while our friends in the cab ahead of us paid only 27. After getting to the hotel, and showing our luggage, Jeannie and I bought our 2-day Hop On Hop Off tickets for 30 Euro total. Having nothing better to do for a few hours, we just “rode the rails” so to speak, taking the farthest bus route. That happened to be right back at the cruise port. We were much chagrined to realize that we could have just hopped on the bus right there and saved ourselves 40 Euro! Our hotel has a rooftop restaurant with spectacular views of the city (see above). And here we are, beginning the last leg of our trip. Tomorrow, the Acropolis! Today was the tour of Delos, an island which is, in its entirety, one big archaeological site. It was originally inhabited by the ancient Greeks, and like Pompeii, you can meander through the streets and imagine what it was like to live there 3000 years ago. Our tour guide ‘Iffy’ was very good, if a bit long winded. Then we took the ferry back to Mykonos town for a whirlwind tour of the tourist district. I felt bad for all the shop owners, because we had no time at all to browse, shop or stop for refreshment. Then we were back on the bus to visit another monestary. We’ve seen several of these along the way, and while I was looking forward to roaming around the grounds, seeing how the monks/nuns lived and worked, in every case, we were shown into the Orthodox church, and that was it. Still, it was interesting to compare the decorations here vs. The Roman Catholic and Protestant churches that we’ve seen so many of elsewhere in Europe. Following the monastery, the group was directed to a tavern for lunch, which may or may not have been included in the price of the tour, we’re still not sure. Ever the non-conformist, Jeannie decided that we would have lunch in a different tavern in the same plaza. We ate at “the Fisherman”, which was excellent. And not crowded. Our next stop was an exclusive beach, where we were given 20 minutes to… I’m really not sure WHAT we were expected to do at a beach for 20 minutes. There wasn’t even enough time to get a beer. Anyway, that was it for the tour. We got back on board and took a quick nap in our stateroom before going to our last onboard dinner. After dinner we went to a show from a guy that was trying hard to be a one-man Il Divo. I won’t say whether he succeeded, but I will say that Jeannie bailed after 2 songs to watch the ship’s version of “What’s My Line”. After that we watched another improv comedy show by Doug Funk. He was pretty hilarious. We didn’t actually dock in Crete until noon, so we had time to sleep in and enjoy a leisurely breakfast before participating in a “speed painting” event, where everyone got 2 minutes to start a water color painting, and then everyone shifted one canvas to the right and got one minute to work on another person’s painting. This continued until we got all the way around the circle of canvases. It was a great idea, I thought. I started painting the Starship Enterprise, but somewhere along the way, one of the other artists decided it looked more like a banjo. Anyway, it was great fun. The ship landed at the far western end of Crete, in a town called Chania. The ship offered excursions to the central area of Crete, where the really interesting parts of Crete are, like the Knossos Palace of King Minos, and other artifacts of the Minoan civilization. 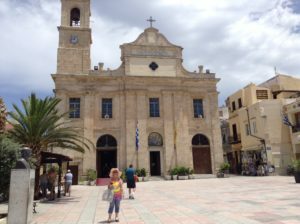 However, they were a 2 hour bus trip away, so we opted for a little shopping in downtown Chania instead. It was great, because I got to sit in a nice al fresco restaurant and sip on some beers, while Jeannie got some shopping therapy. 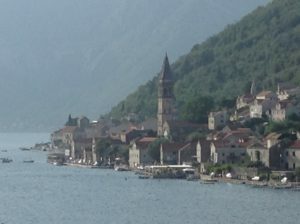 The crew didn’t lie when they said it would be worth getting up early to watch the “sail-in” to Kotor. It was a very impressive view. What was even more impressive was seeing this gigantic ship snaking it’s way through the narrow channel. Jeannie and I took separate excursions this morning; she took a walking tour of Kotor, ending with a lunch in the private home of a famous(?) chef. She said it was a great experience and lots of fun. My excursion took me to a little medieval town called Budva. To someone that had never been to a medieval walled town (like Rothenburg ob der Tauber), it would have been really cool, but for me it was ‘meh?’ Not particularly worth the half-hour drive. The tour guide was unexceptional, as well. She did not anticipate additional customers for her tour and so did not have sufficient radio receivers for the entire group. Guess who didn’t get one? It was OK, though, because she was a boring speaker with a minimal command of English. The walking tour of Kotor was likewise uninspiring — I’d have done better wandering on my own, because the town itself (also with a medieval wall) was pretty neat. There was a switchback road climbing up to a fortress atop the hill which would have been interesting had I not spent the whole morning on the bus. 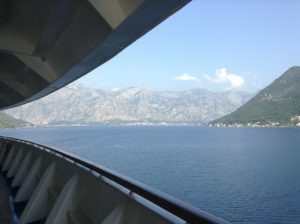 Gotta say though, the scenery was very nice, both sailing in and out. Cruise meals are generally pretty good, which is why I’ve barely mentioned them, but tonight’s leg of lamb was particularly good. After dinner, we saw the comedian Doug Funk, who was very funny and clean to boot. Following that was the movie Jumanji, which we watched on the deck “Under the Stars” on a jumbo tron screen. Really enjoyed the movie.